What’s the Deal with Al-Jazeera? The news network was also praised for addressing sensitive issues such as women’s rights, for giving voice to political and intellectual dissidents, and for the relatively professional standard of its reporting. This was all new to Arab media, which had been dominated by images of kings and presidents embarking upon and disembarking from planes. Speculation became rife that the Middle East was now witnessing an information revolution, galvanized by a courageous satellite channel and the free flow of news on the Internet — and that this media revolution would usher in an era of political revolutions. There was, however, one serious flaw in describing al-Jazeera as a champion of democratization. The channel was careful not to question the legitimacy of existing autocratic regimes, let alone that of the Qatari regime. It did not engage in investigative reporting on the corruption of Arab leaders and their families, and hardly tackled the issue of the Arab world’s democracy gap. When asked why, managers suggested a variety of fanciful answers, from an aversion to tabloid-styled media to Qatar being an uninteresting country. But the truth was simpler. Al-Jazeera was never an independent channel. It was created as an organ of the Qatari regime, and was forced to function in accordance with that regime’s interests. Yet, during the past six months, an apparently new al-Jazeera has emerged: a news organization that openly and intensively supports and promotes democratic revolutions around the Arab world. While the role of al-Jazeera in the upheavals of Tunisia, Egypt, Yemen, Libya and Syria should not be exaggerated, neither should it be underestimated. 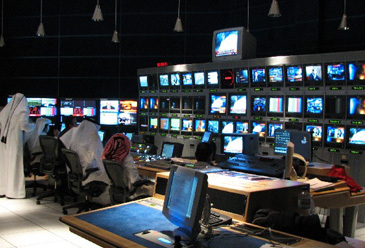 First, al-Jazeera has been the primary source of information on demonstrations and other dissident activities in Arab countries, energizing the continuation of protests, creating a “snowball effect” that carried protests from one country to another, and garnering international attention and sympathy for the uprisings, which proved essential in the cases of Egypt and Libya. Second, by unequivocally praising the uprisings in its political analysis as well as religious broadcasting, al-Jazeera empowered dissidents morally. One explanation that can be ruled out is that Qatari Emir Hamad Al Thani, who ousted his father in a bloodless coup in June 1995, is a democrat. He is not. While he cultivated the image of an open-minded reformist and entrepreneurial leader, his emirate made no progress towards democratization, even by Gulf States’ standards. In fact, Al Thani repeatedly failed to make good on his promises for reforms. On April 29, 2003, a national referendum approved a new constitution that called for the establishment of a consultative council consisting of 45 members – 30 elected and 15 appointed. The new council was to replace an ineffective, appointed council established in 1962, and was to become the emirate’s legislative organ. It was even given the authority to overturn a veto by the emir by a two-thirds majority, although the emir was given the right to dissolve the Council and to veto laws “when absolutely necessary.” However, eight years on, the Council — holding the promise of limited though meaningful participatory politics — has not been established, and there is no indication that it will ever be. Qatar’s democratic experience thus far is limited to municipal elections, the latest of which took place last May. Al-Jazeera has not been balanced in its coverage of Arab revolutions. Events in neighboring Bahrain, a historic rival of Qatar but nevertheless a country in which a democratic revolution may directly impact stability in Al Thani’s realm, were given relatively little attention by the channel; al-Jazeera insisted the reason was not political, and that events in Bahrain simply did not merit as much attention as other uprisings. Throughout the Arab Spring, the channel has refrained from debating the political stalemate in Qatar itself and has avoided the issue of the emirate’s unfulfilled promises of carrying out the 2003 reforms. Al-Jazeera’s coverage of Qatar’s controversial December 2010 winning bid to host the 2022 soccer World Cup final has been triumphant in tone and consistent with the Emir’s ambitious agenda. Issues such as: the criticism of Qatari religious jurists about spending billions of dollars on sporting infrastructure; the senselessness of a country with no soccer tradition and unbearable summer heat hosting the world’s most popular sporting event; and the allegations about Qatari corruption in the bid process, which are prevalent in the international media, have not resonated in al-Jazeera at all. If Emir Hamad is not a democrat, is it possible that al-Jazeera’s democratic change of course resulted from Hamad’s Islamist leanings? This theory is supported by the fact that the revolutions the channel promoted most prominently occurred in countries where regime change could lead to the rise of the Muslim Brotherhood or affiliated movements. During the Tunisian uprising, al-Jazeera gave considerable attention to Rashid al-Ghannushi, an exiled Tunisian Islamist leader. And the main personality commenting on the revolutions on al-Jazeera (along with the Arab nationalist, former Israeli MK Azmi Bishara) has been Yusuf al-Qaradawi, a spiritual leader of the Egyptian Muslim Brotherhood, one of the Sunni world’s leading jurists, and the host of a popular al-Jazeera TV show on Islamic religious law. While the Islamist influence on al-Jazeera cannot be denied, and while al-Qaradawi’s prominence in Qatar has been a cultural-religious fact since 1961, the significance of these factors should not be overestimated. Al-Jazeera has given voice to Islamists, but not only to them. And al-Qaradawi’s removal last year from control over the popular internet portal he headed since 1997, IslamOnline.net, proved that while religious jurists are respected in Qatar, they don’t always get the last word. The Emir could have prevented the dismissal of the aging sheikh, who transformed his emirate into a hub of religious scholarship, but his inaction hinted that he would not be under the thumb of any one ideologist. World Cup, and aims to diplomatically engage in Palestinian politics and Arab-Israeli negotiations: he likes to punch above his weight. So far, he has managed to keep himself and his emirate safe and proud in the ring. But that is no guarantee for the future. Uriya Shavit is a research fellow of the Moshe Dayan Center for Middle Eastern and African Studies at Tel Aviv University.